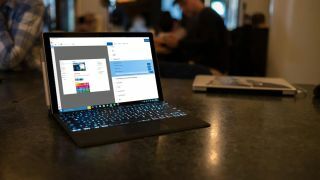 Microsoft has released a new app called Language Community, which allows Windows 10 users to provide better translations for settings and apps in the operating system. The idea behind the app is for people who use non-English language versions of Windows 10 to correct any mistranslations. This can be done quickly and easily by taking a screenshot of the text, then using the Language Community app to select the text and add your own suggestions for a more accurate translation. If other people have submitted suggestions as well, then you will see those, and you can upvote any that you think are the best. Those suggestions will then be sent to Microsoft, which should then make those changes. The Language Community app is available from the Windows Store to download, however, you currently need to be part of the Windows Insiders program and running an early version of the Windows 10 Fall Creators update to install it. It’s easy – and free – to sign up as a Windows Insider, but if you’d rather wait for the final version of the Windows 10 Fall Creators update, you’ll be able to download it on October 17. We feel that this is a great move by Microsoft. By crowdsourcing improvements to its various translations, especially for more complex and less widely-used languages, we should hopefully see future versions of Windows that are easy to use no matter what your language is.